The most disappointing match to be played in the tournament will take place this Saturday, July 12 at 4:00pm. 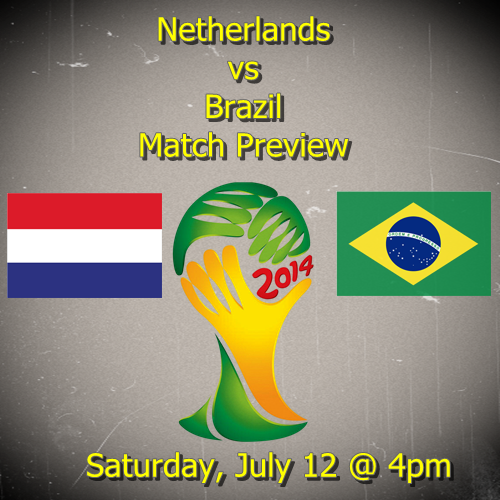 The Netherlands takes on hosts Brazil in the third place World Cup match. This is one in which both teams will have a difficult time getting themselves excited to play in. I have always found it somewhat odd that they play a third place match considering how little is at stake. The winner gets the dubious distinction of coming in third, which isn’t a whole lot to play for. Even with nothing on the line, both teams will want to win this one regardless of what they say. This has now come down to a pride factor, especially for Brazil. Failure to win in this match will only heap more misery on their shambolic World Cup. There really never was a time that Brazil impressed during this tournament. Even when they were winning, it was never a truly convincing performance and they relied far too much on Neymar to carry them through. Watching their demolition by Germany it was apparent from the very beginning that the match was going to have only one winner: Germany. Brazil played far too open and they paid the price. The Netherlands will be able to hold their heads high after this World Cup. At the start of the tournament there were many who thought they would not even get out of the group stages. Instead, they made it as far as the semi-finals where they just could not overcome a stalwart Argentina defense. This is a young team which could mean that they will be playing for the win and the chance to prove themselves to everyone one last time. My prediction is a Netherlands win, but one that may not come until deep into extra time or even penalties, although I do believe Holland will finish them off in normal time. I have a strong feeling that the Netherlands will play with a somewhat rotated squad and that Brazil just might do the same. The third place match is often one full of goals and this should not disappoint. The Netherlands should have plenty of ways to exploit Brazil, but the question will come as to whether they will have the intensity to defend so well in this match compared to their previous 6. The weather forecast for Saturday in Brasilia is actually looking quite good, and even better than that for the final. While the highs will be in the low 80’s the lows will be down into the 60’s. Additionally, it is supposed to be mostly sunny and with only 48% humidity, which shouldn’t be too bad.